Windmill palms (Trachycarpus fortunei) are compact, sturdy palms with furry, fiber-covered trunks and wide, graceful, fan-shaped fronds. These palm trees are desirable for their attractive profile and for the fact that they are very cold hardy. 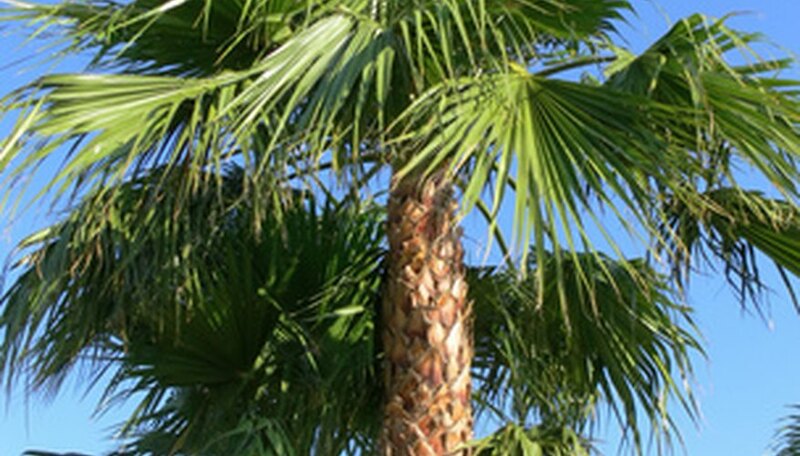 Windmill palms can survive temperatures as low as 10 degrees Fahrenheit, according to the University of Florida. These palms, which are readily available, are often used by home gardeners as specimen or accent trees. Windmill palms are slow growing, according to the University of Florida. In the wild, they can reach heights of 40 feet, but in cultivation they usually grow to an average height of 15 feet. The individual fronds can be as much as 3 feet wide. The neatly symmetrical crowns of these trees average about 10 to 12 feet in diameter. Windmill palms grow in temperate climates. They thrive in areas that have mild winters and warm summers. These plants grow best in U.S. Department of Agriculture (USDA) plant hardiness zones 7 to 10, according to Washington State University, although some have been found growing as far north as Vancouver, British Columbia. Windmill palms grow best when planted or located in an area where it will receive partial afternoon shade, according to Washington State University. The tree is hardy and will adapt to most types of soils, including slightly salty soils. It does not grow well, however, if planted in soil that is overly saturated with water. Windmill palms are hardy trees and are relatively pest-free. In some locations, particularly in the South, they can be plagued by minor insect pests such as scale and palm aphids. Small infestations can be rinsed off with a strong stream of water, but major infestations may require the application of an insecticide. Windmill palms look best when grown in groups, according to Floridata. They are excellent grown in containers if the containers drain well and look especially nice when placed near a patio or other gathering area. These trees are often planted at the entry of buildings, where they lend a formal air to the landscape.